1. Preheat the oven to 450 degrees. Place the panko in a shallow dish and add the Old Bay seasoning and olive oil, mixing well to combine. 2. Break the egg into another shallow dish and beat in a few dashes of salt and pepper. 3. Dip the strips of tilapia into the egg and then into the panko mixture, pressing the panko on firmly so that it sticks to the fish. Place the sticks on a baking sheet lined with foil. Once all the fish has been dipped, bake in the preheated oven for 15 minutes or until golden brown, rotating the pan halfway through. 4. Serve with fresh lemon wedges, tartar sauce or cocktail sauce, or all three! I bought a box of Gorton’s breaded fish sticks to compare to the homemade batch because I think Gorton’s are the tastiest frozen fish sticks I’ve had and the breaded variety seemed similar to this recipe. The results of the comparison were kind of inconclusive. We all agreed that the fish in the homemade sticks tasted fresher and had a better texture while the Gorton’s sticks had a very strong “fishy” taste and a bit of a mushy texture. 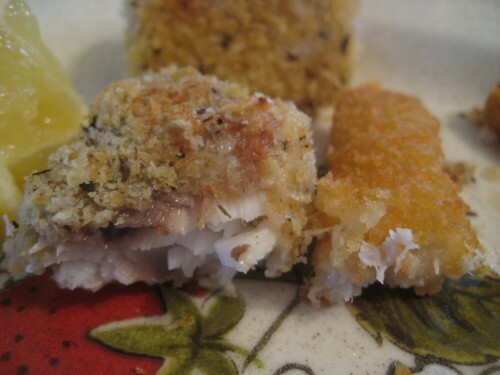 The difference in texture was easily explained by the phrase “made with minced fish” on the box of frozen fish sticks; whole fish is infinitely preferable to “minced”. The coating, however, was another matter. Gorton’s coating is nice and crunchy and had, according to one taste tester, a pleasant “buttery” flavor. The homemade coating was good, but not quite as crunchy or flavorful as Gorton’s. Maybe I should add some salt to the panko coating or use melted butter in place of olive oil. The difference in price was the most surprising part of this comparison to me. The homemade fish sticks were actually a bit cheaper to make than the frozen! I was anticipating that the frozen sticks would be way cheaper so this was a nice surprise. The time difference might be a factor for some people as the homemade fish sticks took twice as long to make as the frozen, but 35 minutes is still a pretty fast dinner. Bottom Line: The convenience and extra crunchy coating of frozen fish sticks make them the perennial favorite when you need a fast meal for children. 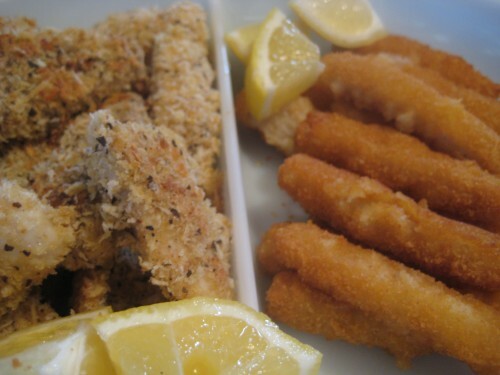 Homemade fish sticks, however, were a cheaper, fresher tasting alternative that you could easily serve at a casual dinner for adults or children alike. Thanks for the recipe. I have been frying mine but I’m going to use your method of mixing a little oil with the bread crumbs first then baking them. Living in Germany I am really enjoying the fresh sea food. I go to a “supermarche” in France, just about 45 minutes from my home, to get fish. Last time I used cod and used the fish sticks I made for fish tacos. Yum!